P - Jalen Carvalho, Hilo, 12; Joey Cantillo, Kailua, 9; Tyler Fujimoto, Moanalua, 12; Trevor Inouye, Iolani, 12; Royce Komesu, Kailua, 12; Jacob Maekawa, Mililani, 10; Cole Nakachi, Mililani, 12; Reece Okura, Roosevelt, 12. DH - Noah Auld, Kailua, 10; Jarrett Lum, Mid-Pacific, 12. U - Zachary Recolan, Campbell, 12; Brandon Roberts, Kalani, 12; Dylan Sugimoto, Waipahu, 12. C - Tyler Aburamen, Waiakea, 12; Dalton Kalama, Kailua, 10; Tryzen Patricio, Campbell, 11; Ethan Rosehill, Kamehameha, 12; Noah Shackles, Mid-Pacific, 11; Sean Sonognini, Mililani, 11; Makana Victorine, Baldwin, 12. 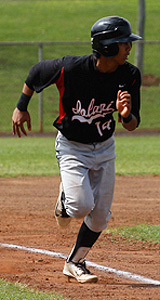 1B - Makana Arakaki, Kamehameha, 11; Awa Byers, Kailua, 10; Ryan Kiyotoki, Mid-Pacific, 12; Corey Nakakura, Iolani, 11. 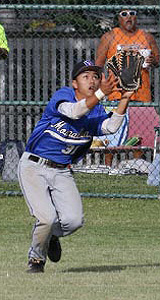 2B - Kobie Russell, Waipahu, 9; Brendan Uchima, Saint Louis, 10; Ryne Yamashiro, Mid-Pacific 10. 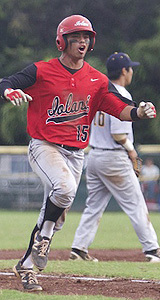 SS - Michael Austin, Kaiser, 12; Beau Branton, Punahou, 12; Jobe Ibana, Campbell, 11; Micah Kaaukai, Hilo, 12; Justice Nakagawa, Mililani, 11. 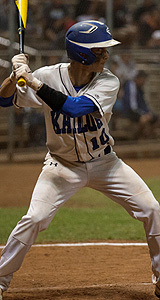 3B - Nicholas Bottom, Mid-Pacific, 12; Keola Himan, Campbell, 11; Taylor Mondina, Waiakea, 10; Dustin Tsukano, Roosevelt, 12; Brendan Uchima, Saint Louis, 10. 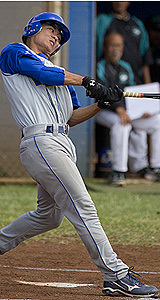 OF - Blayze Arcana-Llacuna, Campbell, 11; Matt Camacho, Waiakea, 12; Adam Connell, Mililani, 11; James DeJesus, Kamehameha, 12; Jacob Gribbin, Saint Louis, 12; Cameron Igarashi, Mid-Pacific, 12; Cal Muramaru, Mid-Pacific, 12; Noah Serrao, Hilo, 11; Kaimana Souza-Paaluhi, Mililani, 10; Dewayne Sprinkel, Campbell, 11; Ricky Van Gelder, Leilehua, 11; Jameson White, Kailua, 12. 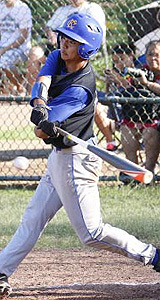 Saint Louis School senior Jordan Yamamoto is as well-rounded a player there is in the state. 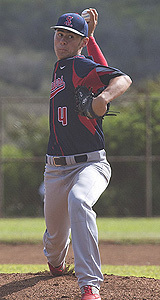 For that, he is ScoringLive's All-Hawaii Division I Baseball Team's Player of the Year. While it is his power pitching that earned him a scholarship to the University of Arizona and made him a prospect for this weekend's Major League Baseball First-Year Player Draft, it was his all-around play that netted him this recognition. 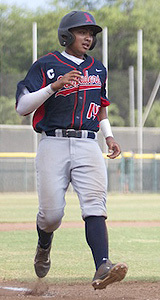 On days he was not on the mound, he patrolled the outfield. When his catcher was unavailable, the Crusaders turned to him. He was one of the reasons the Crusaders were able to win their first state championship in 40 seasons. "He could have been one of the best catchers in the entire state, if that's all he wanted to do," Saint Louis coach George Gusman said. 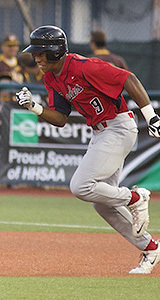 "He has more than enough speed to play in the outfield and is a very good hitter." 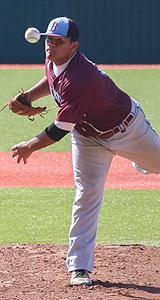 Yamamoto was at his best on the mound, where he posted an 8-2 record with a 1.79 earned run average. He tallied 70 strikeouts in 62 2/3 innings, while allowing 46 hits and 23 walks. He faced some of the toughest lineups top down in the highly competitive Interscholastic League of Honolulu. He proved himself on the biggest stage against the state's top pro prospect. 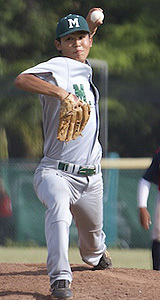 In the quarterfinals of the state tournament, he was pitted against Waiakea's power left-hander Kodi Medeiros, a projected first-round pick in the draft. 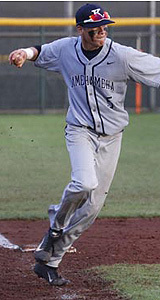 Yamamoto won the duel of aces, 2-0, pitching a two-hitter with nine strikeouts to send the Crusaders to the semifinals. Yamamoto's fastball sits at 89 mph and touches 93 mph. He messes up hitters' timing with a slider, curveball and change. 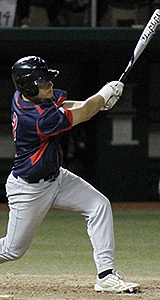 He was not shabby at the plate either. 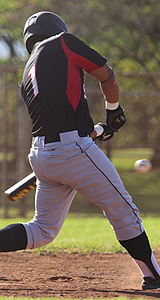 He batted a respectable .324 with two doubles and a home run with nine RBI. He also drew 10 walks. 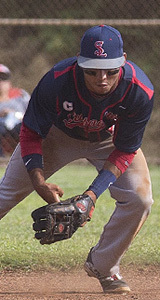 On defense, he held his own in the outfield and was well-respected behind the plate, Gusman said. "When he caught, teams would not try to run because they knew he could not only throw the ball, but also had a quick release," said Gusman. 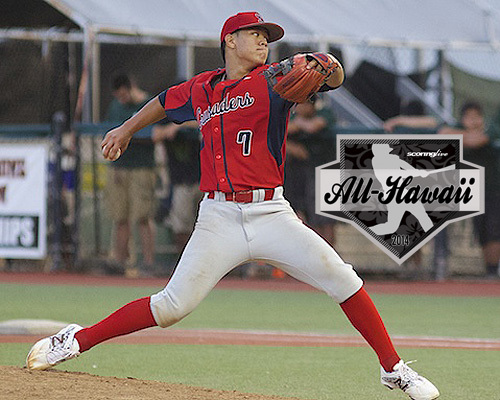 » Download a printable version of the 2015 Division I All-Hawaii Team. Twice in his five-year tenure as the Crusaders' coach, George Gusman's team had he seeded berth in the state tournament. 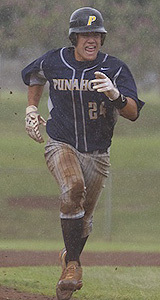 In 2010, his second-seeded Saints finished fourth; in 2011, his top-seeded team lost in the quarterfinals and finished tie for fifth (game was rained out). Then this season, as an unseeded team, the Crusaders won it all. Gusman had some tough decisions to make en route to winning the school's first title since 1974. One was the starting pitcher for the opening round of the tournament. The rule of thumb is to use your ace, in this case, Jordan Yamamoto. But Gusman showed confidence in his No. 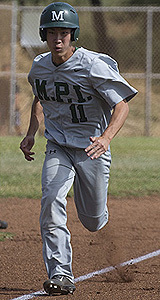 2, Pono Anderson, who rewarded the coach's decision with five innings of shutout ball in a 13-0 win against Roosevelt. 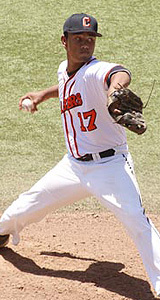 That move enabled the Crusaders to use their ace against third-seeded Waiakea to set up the greatest duel in the 56-year history of the tournament because it pitted two highly-touted prospects. Runs were going to hard to come by against Medeiros, so Yamamoto was the only answer. 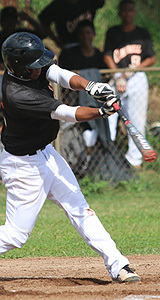 But the key to the championship came in the semifinals against second-seeded Campbell, which had pitching to match against the Crusaders. 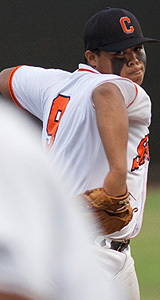 So Gusman gave the ball to seldom-used left-hander Peyton Oshiro, who delivered a two-hit performance over six innings with Anderson finishing up the final inning. Although a senior, Oshiro was a work in progress. Knowing his team needed a third starter for the state tournament, Gusman began developing Oshiro late in the season. He gave Oshiro a start in a win against Pac-Five. 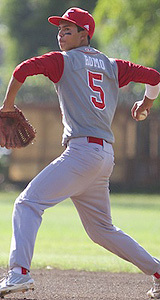 He extended the experience with a win against 'Iolani in an elimination game of the ILH tournament. Each game he went five innings. 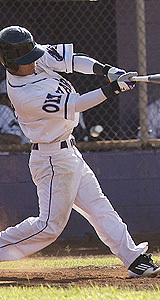 Gusman gave Oshiro another tuneup in a scrimmage against an OIA team. 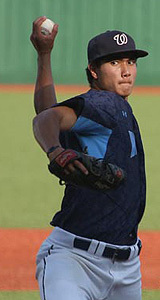 Oshiro proved he was ready for prime time and earned the state tournament start. It was the bridge Saint Louis needed to get to the title game.